Flag Identifier - Vexphoto - Student demonstrations. 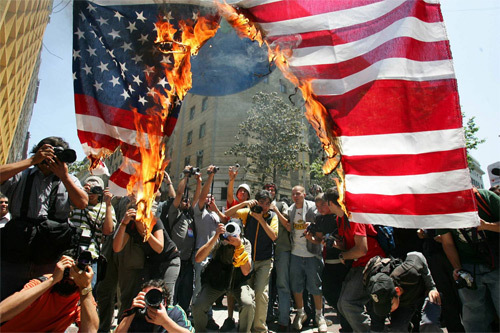 Photographers gather around an American flag which was set on fire by protesters during a demonstration in Santiago, Chile, Wednesday, Nov. 17, 2004. Angry students opposed to an economic summit of Pacific Rim nations and U.S. President George W. Bush battled police for hours Wednesday, hurling rocks at riot police who responded with tear gas and water cannon blasts.